I prefer to use locally grown flowers. But what does that mean, and why does it matter? In this post I’ll share a bit of what I know about the floral industry, where flowers come from, and why I think it is important to source from local and domestic farms. Lots of people are tuned in to the farm-to-table movement. The phrase “Slow Food” is now a pretty familiar one. But how about “Slow Flowers”? I want people to make the same connections when thinking about flowers. While choosing locally grown flowers is definitely about getting the freshest product available (which will be the longest lasting), for me it is also an act of social and environmental politics. If you care about sustainable farming; quality of land, air and water; farmworker rights; and our local & domestic economy – then I think you’ll connect with the importance of supporting the locally grown and the American flower farming movement. Did you know that most of the flowers you see in your local grocery store or flower shop come from far away? Currently about 80% of the flowers sold in America are imports. Most of our flowers come from Ecuador, Columbia, even Africa! Workers in those places are paid little, and their governments do not always do the best job of regulating working conditions or pesticide laws. The story of small flower farms mirrors that of the small food farmer. It used to be that growing flowers in America brought a living wage to a farmer. With the advent of global trade, airline shipping, cheaper wages overseas, and rising real estate prices, our nation’s flower farmers found themselves unable to compete with the cheap exports grown so close to the equator, where lots of sun and low wages supply big blooms for little money. The flower farming industry shifted to overseas. Most American flower farmers threw in the towel and had to find new ways of making their living. I believe in local agriculture, in a living wage and in the basic human need for natural beauty. It is part of my business mission to source locally grown flowers and foliage, starting on Whidbey Island, then moving to Washington State, Oregon, California and finally the rest of America – in that order, as season allows. I most prefer to support the small local farmers in my state or at least on my coast. I have a relationship with these farmers. I know they act as stewards of their land, taking great care to maintain habitat, limit the use of pesticides, monitor runoff of fertilizers, and to build soil health. Though our government is far from noble when it comes to pesticide laws, our laws are more stringent here than they are in South and Central America where most imported flowers come from. We have better workers rights than in most other countries in the floral export game. 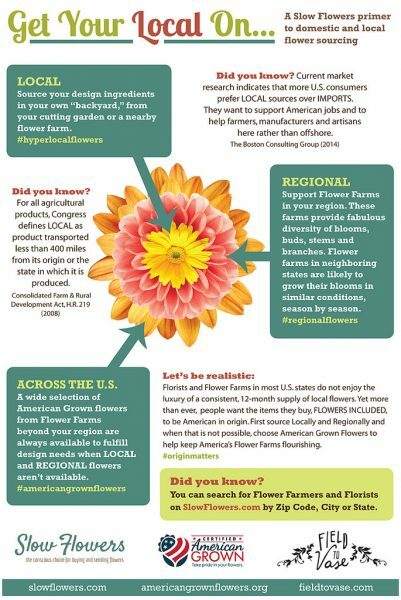 The great news is that with the resurgence of the locally-grown movement, flower farmers are sprouting up across the United States. We need to support those farmers by buying from them and paying respectful prices for their products. By investing in locally grown flowers, you are preserving farmland and supporting the health of your local economy, and of your local environment. I’d much rather drive by a farm than a strip mall – wouldn’t you?! 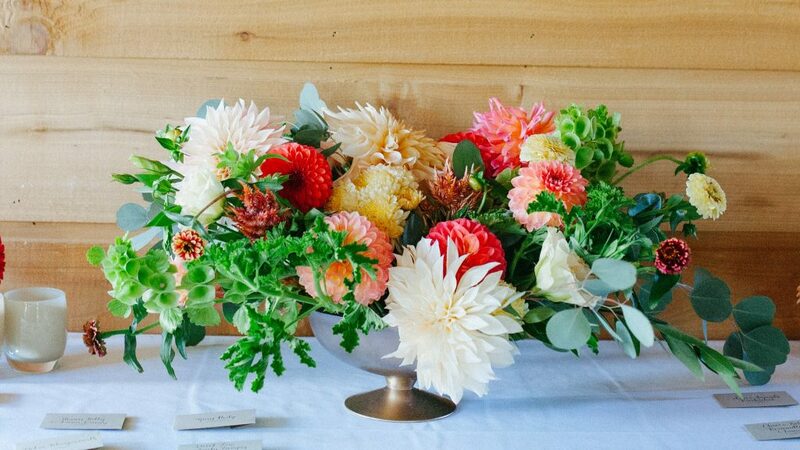 By sourcing American grown flowers, you can get the freshest flowers possible, and also get varieties and qualities you cannot find on the import market. Dahlias, for instance, do not ship well. Their delicious tissue-like petals bruise too easily to survive packing. Consider what breeding for transcontinental traffic has done to flowers. Recall the classic grocery tomato – bland, pale, mealy – vs. an heirloom tomato from a farmer market stand – juicy, colorful, fragrant, delicious. The same applied to a Rose; the varieties that are bred for shipping is the mirror to that grocery tomato – fragrance-free, totally straight, stiff stem. In flowers, there is a genetic link between fragrance and longevity; the more fragrant a flower, the shorter its life span. In breeding for a long-lasting bloom, growers have had to bid farewell to fragrance. That grocery tomato and the grocery rose are sad sisters – no flavor, no scent. While they do last for a while on the counter, I’d take flavor and fragrance over shelf life any day of the week. How about you?! (and I totally don’t mean to pick on grocery stores – there are several out there that are catching on, and are supporting local flower farms. Please, go out and support those stores and florists that are stocking locally grown!). If a grower is shipping from Oregon or California to Washington, they are unlikely to treat their flowers with toxic anti-transpirants or fumigants. In contrast, when flowers face 3 days to a week of transport, crammed in a box, in and out of trucks and planes and hot runways – that grower is definitely treating her or his blooms. Fewer miles also means that flowers are out of water for a shorter duration – or may even have been trucked in water – which means the flowers on your table are fresher if they were grown in your own country. Now, there are those occasions where an Ecuadorian Rose, a Japanese Sweet Pea, or a South American Hydrangea is a special request or is the best solution to my customer’s request. When that time comes, I will be grateful for the choices that abound. But as much as I can, I will shop as close to home as possible, and always with a first-choice emphasis on sustainably grown. 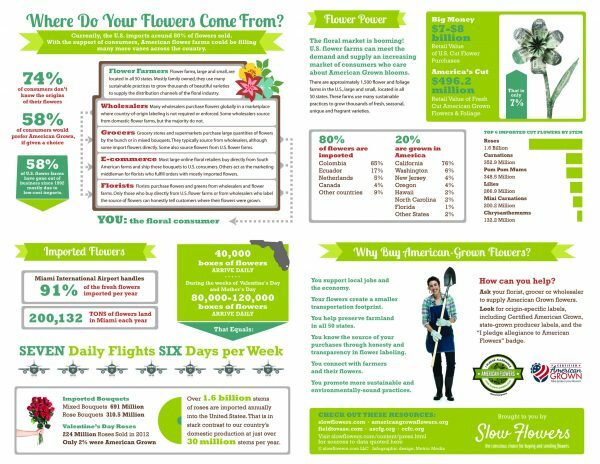 Special thanks to SlowFlowers.com for these great infographics. If you’d like to read more, check out Amy Stewart’s book Flower Confidential. Tobey, thanks so much for your thoughtful words and action. Love everything that you do and all your support for local flowers. You continue to inspire me!